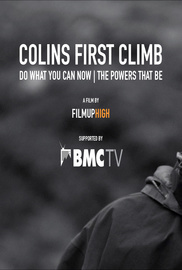 Colin Goodey is a legend of the North Wales climbing scene. He has been climbing for more than 70 years and has put up more than 40 new routes. Rock climbing has always been his life and soul - shaping many of his big life decisions and influencing all aspects of his life. Colin has been diagnosed with a terminal illness and having been told by the doctors to "do what he can now" he wanted to do one last climb. This film follows him as he repeats the route he first climbed aged 10 years old, the route where it all began.